(SPOILERS) Alternatively known as The Fast and the Furious Six, if you follow the chronology (on account of a key character here dying and then showing up in subsequent F&F masterpieces. Which means I ended up catching this in very nearly the correct order (I have yet to see the actual the officially monikered Fast & Furious 6. This is the only one in the series that doesn’t feature either Paul Walker or Vin Diesel (well, almost the latter; he is wooed for a cameo, prior to his triumphant return in Fast and Furious (or, Fast Three, if you will). There are those who argue this is the underappreciated peak of the disposable franchise, but that’s a bit of a leap; it’s as laden down as ever with clunky plotting, spinning wheels, macho stand-offs and raptastic montages featuring scantily clad girlies ((the latter abjectly failing to disguise the auto- and homoerotica dripping from every shiny hood and protracted bout of male bonding). This time out, Lucas Black’s (who first found fame as a child actor, starring in the one-season wonder American Gothic) Sean is so much darned trouble to his poor mum, getting up to all sorts of mischief with his racing delinquency, that she packs him off to Tokyo to live with his Naval father (Brian Goodman). 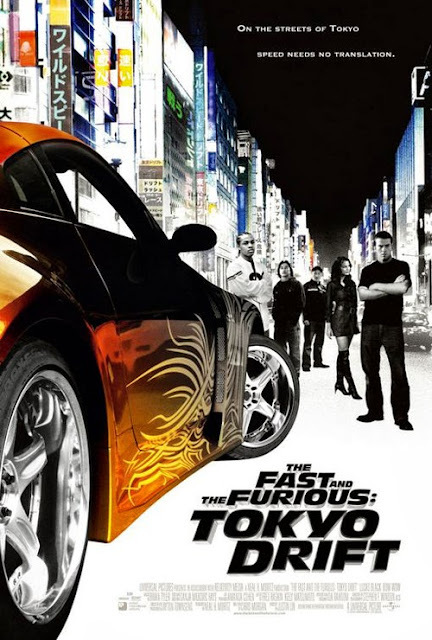 He quickly falls in with Han (Sung Kang), who has a business relationship with the nephew of a Yakuza kingpin D.K. (Brian Tee). He even finds a bit of time to romance D.K.’s girl (big mistake!) Neela (Natalie Kelly) when he’s not bromancing. Arguably all this auto-fetishism is more age-appropriate to Black’s teenager than Vin’s 40 year old, but it makes the high school meets organised crime plotline seem more ludicrously adrenalised than any other installment in the series. This culminates in Black’s young punk standing up to uncle Shin’ichi Chiba, effortlessly persuading him to permit a race with his nephew to settle matters. I mean, as if any self-respecting gangland boss wouldn’t take him out the back and have a rusty screwdriver lodged in his ear. These are fantasy wish-fulfilment flicks, of course, and director Justin Lin knows that very well; he would go on to direct three ever-more hyperbolic sequels. But the other problem here might be that Black is too good an actor for all this nonsense. His homespun southern drawl suggests a sincerity that doesn’t really fit with all this motorised silliness. There’s subtext spinning off every fender in this one, though. Sean is so all-American it’s not true, and he arrives in Japan ready to teach the nation a thing or two about honour; it’s just like WWII all over again! Or like Tom Cruise in Last Samurai; a land known for its codes discovers that the foreigner has even stronger core values! If anyone can show the Yakuza how things really are, it’s a teenager from the Land of the Free. With a little help from his dad (US military might goes with its citizens wherever they are in the world). Miraculously, when Sean stands up to Uncle Yakuza, he can suddenly speak fluent Japanese! It’s amazing! The movie is careful not to give Sean a Japanese best friend, girlfriend, or mentor (they’re all expats); all the better to accentuate those national divisions! It even throws in a bit of Star Wars while it’s at it; Lucas (Luke Skywalker), sounding all the world like a farm boy, must battle the “evil empire”, and is aided in this by an Obi-Wan who teaches him how to use the force (“the drift”) before Kenobi exits stage left (yet manages to live on through a number of sequels). The only difference is old Ben didn’t pull 360s around ladies’ cars in order to convince his young padewan that he really is heterosexual, really. Han was best pals with Vin’s Dom you see. When Sean and Dom meet, they discuss their mutual pal. It’s a conversation purportedly about models of automobile, but I think it’s quite clear what’s going on. Sean: I didn’t know he was into American muscle. Dom: He was when he was rolling with me. Sean will be rolling with Dom in Fast & Furious 7. My testosterone nozzle is full to burstin’ in anticipation.